Hi everyone! I hope you’ve enjoyed the Taylored Expressions‘ October release previews over the last several days. All new stamps and dies are now available in the TE store. Before you head over, I have two more samples to share. 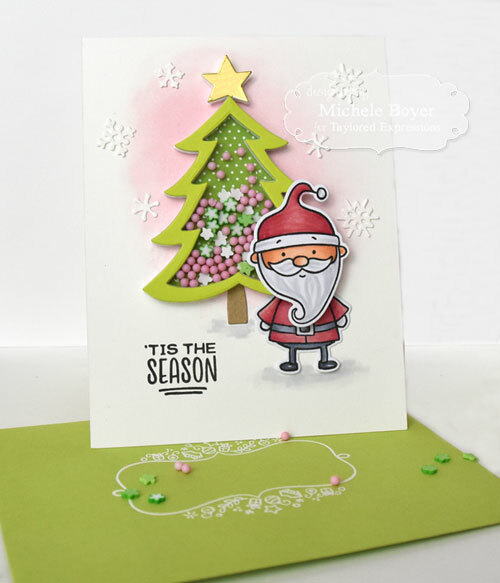 First, I used Santa & Friends with new Tree Shaker die set. 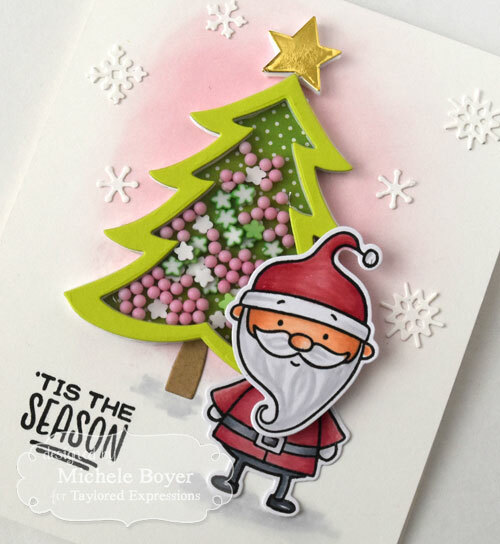 After sponging a bit of Cupcake ink into the center of my card, I die-cut the tree from green dotted paper (from Rainbow Brights paper pack), Granny Smith card stock and from a foam adhesive sheet. I assembled the tree, dropped in some Queen & Company Pops and Fimo Fun, then covered with acetate and the Granny Smith frame. 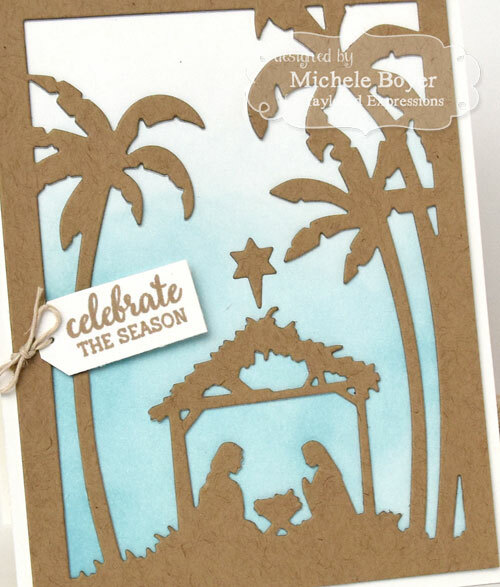 The star was cut from a foam sheet and then new Gold Foil card stock and positioned above the tree. I adhered Santa’s head to the bottom right of the tree then positioned his body below, accordingly. Little Bits Snowflake Confetti finished off the wintery scene. 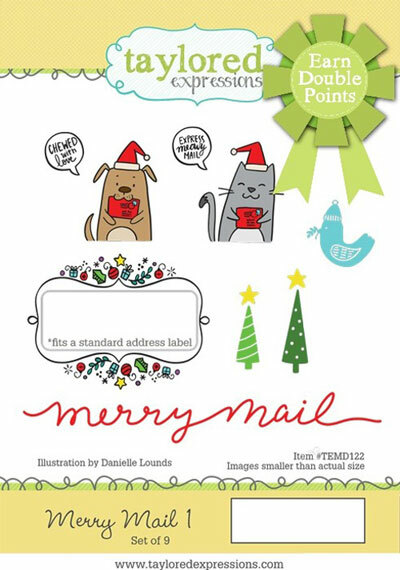 To quickly and easily decorate a coordinating envelope, I stamped and white embossed the label shape from new Merry Mail 1 stamp set. My second card was super simple, but as simple as it is, that’s how much I love it. I adore the new Nativity Cutting Plate. I lightly sponged a background using Sprinkles ink, concentrating more color toward the bottom. 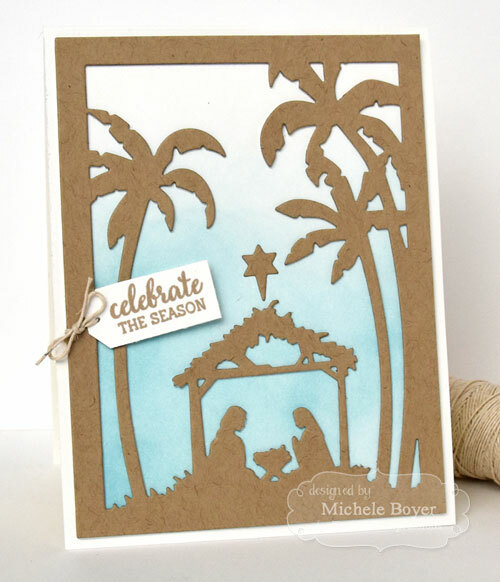 The scene was die-cut from Toffee card stock with a small sentiment stamped from new Sleigh Bouquet. The star above the manger is from new Build a Scene Nativity. 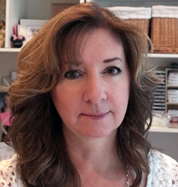 To see more projects, please head over to the TE Blog for a complete list of our designers. 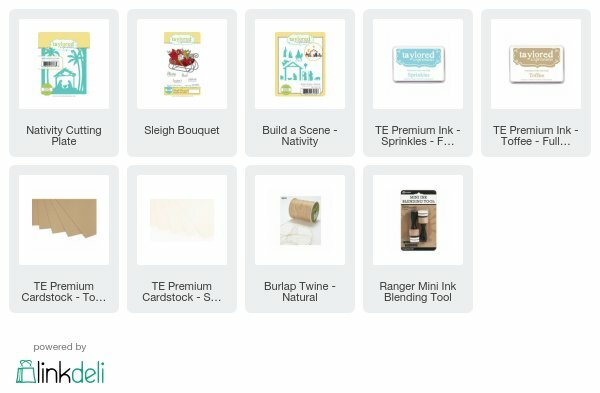 Also on the TE Blog today, you’ll find a list of winners from the preview posts. You might be one of them! On a sad note, this will be my last release with Taylored Expressions. Life has gotten very busy and I felt it was time to cut back on my crafting responsibilities. I’ll still be using TE product, just not as part of the design team.